Industrial plastic shell, stalwart and endurable. 1.Adopts Japan 1/3"sony Exview CCD, with high sensitivity, still get clear image at night or poor-light condition. 2.Japan original CCD, no flash, colorless bleaching, with high capability of color reproduction, recording natural and clear image. 3. Adopt world advanced BELLDSP digital signal processing technology, providing excellent-quality image. 6.Single color, color to black and the color to black sense of IR functions can be customized. 7.Automatic backlight control (BLC), automatic gain control(BLC), and automatic white balance (AWB) ,etc functions. 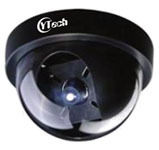 8.Using standard DC12V power, compatible 3.6-16mm fixed lens. This model is suitable for indoor application where have good light ,such as lobby, airway, room, hall etc,.